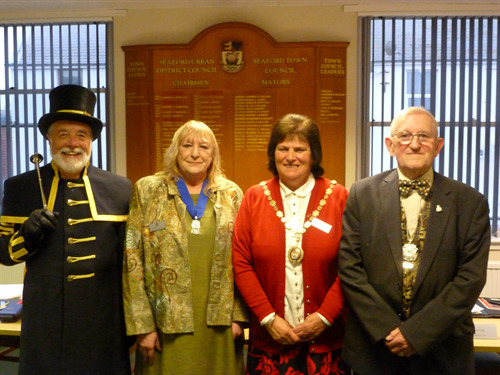 The Council held its Annual Meeting on Thursday 18th May and is pleased to announce that Councillor Linda Wallraven has been elected as Mayor of Seaford for the coming Municipal Year. Having served as Mayor for two years in 2011 to 2013, Councillor Wallraven is thrilled to be back in office, supported by her close friend and consort, Liz Holland. The Mayor will be making an announcement in due course about her chosen charities for her time in office as Mayor and about the year ahead for the Mayor of Seaford. Upon receiving the chain of Office, Councillor Wallraven thanked Councillor Lindsay Freeman for all that she had done and achieved during her year in Office as Mayor, with the support of her consort, husband, Councillor Nick Freeman. Immediately following the election of Mayor, the Council voted Councillor Mark Brown to the position of Deputy Mayor of Seaford; having taken this on originally in October 2016. Councillor Brown served as Mayor of Seaford from January 2014 to May 2016, putting him in good stead to support Councillor Wallraven as Mayor. (L to R) Seaford’s Sergeant-at-Mace and Town Crier, Peter White; 2016/2017 Mayor, Councillor Lindsay Freeman; 2017/2018 Mayor, Councillor Linda Wallraven; 2017/2018 Deputy Mayor, Councillor Mark Brown.